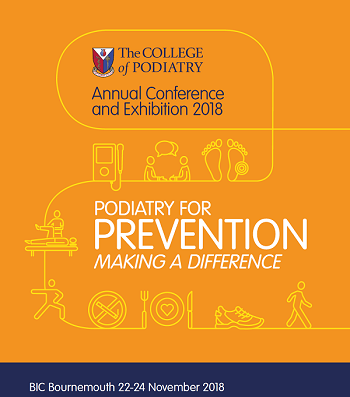 The College of Podiatry Conference is a phenomenal success story and this year over 1,300 podiatrists, 100 speakers and over 75 exhibiting companies are expected to attend in Bournemouth from the 22nd-24th November. Providing a fresh and diverse educational programme packed full with renowned scientific speakers, specialist concurrent sessions and skills-based workshops, the conference will update the delegates on the very latest scientific research, innovations, clinical and business skills which they can take back to their workplace. The delegates can also obtain a good proportion of their annual CPD requirement over the three days from over 50 specialist sessions and workshops covering a wide range of subjects and levels of expertise.